If you’ve been waiting for the final event that will bring you the first ever evolution for your Nascent Indrik mount, then look no further. The Jester’s Festival is now on and here’s everything you need to know about the rewards and frivolous fun to be had! 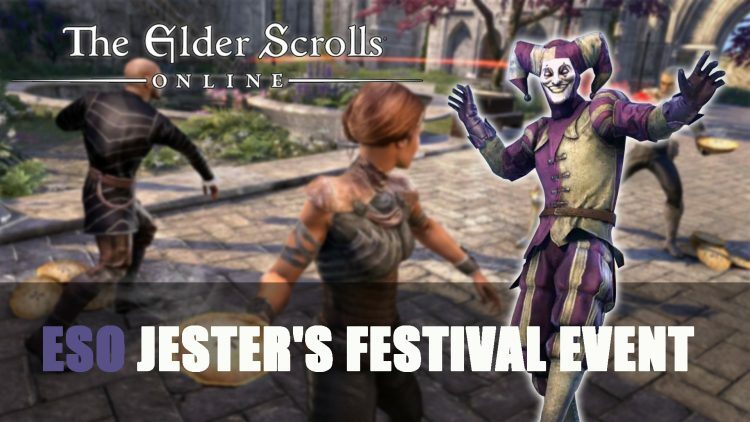 The Jester’s Festival is available to Elder Scrolls Online players from Thursday 21st March at 10:00AM EDT until Tuesday 2nd April at 10:00 AM EDT. In order to take part you will need to travel to the pavilions which are located in Ebonheart, Vulkhel Guard and Daggerfall. Once you reach the event area you will need to talk to any of the three Jesters who are dressed up as Skald-King, Queen Ayrenn or the High King Emeric. This will take you on the intro quest called “The Jester’s Festival”, which lets you gain the Pie of Misrule. Players should note if you have completed the quest last year you won’t need to redo it. Using the Pie of Misrule Memento during this special event will give you a 100% XP buff for two hours. The bonus will only be available during the event, but the Memento will still be part of your collection. Each day through the event, players can part-take in daily quests given by the Jester at three different locations, allowing you to complete three quests per day. Like with any ESO event there are some rewards to pick up, after completing the Jester’s daily quest you will gain a Jester’s Festival Reward Box. These will contain a range of amusing consumables, recipes, valuable items and furnishings. The first daily Jester quest to be completed each day will grant you a Jester’s Festival Stupendous Box instead (regardless of character)! Arm yourself with the weapons of the rag-tag knight himself! Collect the different parts for two new Mementos: the Festive Noise Maker or Jester’s Festival Joke Popper. Valuable-but-silly items you can sell to vendors for gold. Tradeable runeboxes containing last year’s Mementos: the Jester’s Scintillator and Cherry Blossom Branch. You can up to three Stupendous Reward Boxes a day and if you decide to the quests again on a different character, you will receive the regular Jester’s Festival Reward Box. It’s possible to keep earning three regular Jester’s Festival Reward Boxes with different characters each day, Stupendous Reward Boxes and regular Reward Boxes will reset at 2:00AM EDT. You will also receive a Jester’s Festival Pie from the Jester Festival Reward Box. 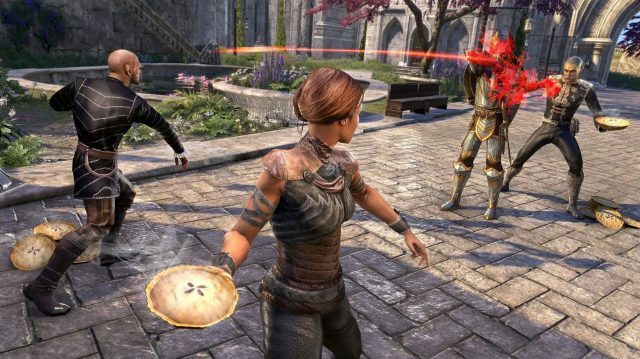 While this pie may seem harmless and delicious, it also grants players a projectile which can be thrown at NPCs, guards and even other players. But you should probably note that not everyone likes to be greeted with a pie to the face, city guards may take offence. 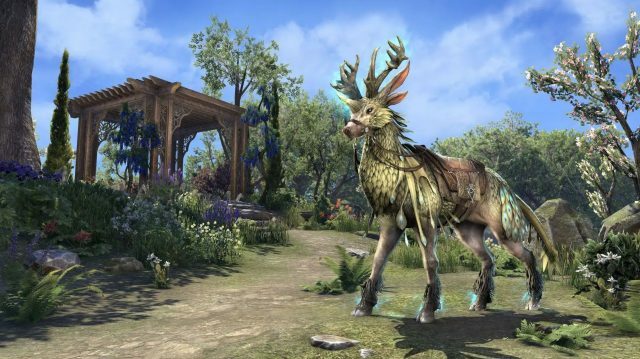 Taking part of the Jester’s Festival will also grant you Event Tickets which go towards buying feathers to create a Nascent Indrik Mount or berries. This is the fourth event of the first quarter, meaning the last berry can be obtained during this event. For more details about How to Evolve Your Nascent Indrik Mount check out our article. You can earn up 24 tickets during this event, with a maximum of two event tickets per day. You can obtain Dawnwood Berries of Bloom, Dawnwood Berries of Budding, Dawnwood Berries of Growth, and the Dawnwood Berries of Ripeness from the Impresario merchant. If you’ve gained all four of these berries you will be able to transform you Nascent Indrik into the Dawnwood Indrik! Make sure you have all four berry types in your inventory and then use them to evolve your Indrik. If you want more Elder Scrolls Online content be sure to check out our recent guides in Elder Scrolls Online Depths Of Malatar Dungeon Guide and Elder Scrolls Online Frostvault Dungeon Guide. For more ESO related news be sure to read next ESO: How To Evolve Your Nascent Indrik Mount. You can also read in ESO: 10 Things To Be Excited About For 2019.